You may find that standard hospital practices often include medical interventions. It is important that you be involved in the decisions related to your care. You can do that by asking questions in advance and openly communicating your desires for the birth of your baby. When a medical intervention is suggested or presented as routine procedure, ask about the benefits, risks, alternatives and whether you can do the procedure later—or not at all. Research shows that many times interventions are done more for convenience than for medical reasons. 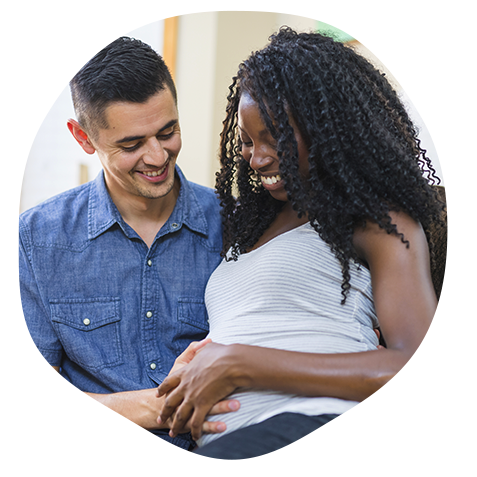 Being well-informed about the common interventions that might arise will enhance your confidence in making decisions during birth. Educate yourself, communicate your preferences in advance and stay involved in all decisions related to labor and birth. Your belly has become full and your skin is stretched taut. Your belly button has turned inside out. You waddle when you walk and you can no longer tie your shoes. You may be getting comments that you look “ready to pop” or people may ask if you’re having twins. All these things may make you question your ability to give birth to your baby. Do your best to try and relax as much as possible. You are designed to grow and birth your baby. Relaxin, a hormone produced during pregnancy, has been softening your ligaments so that your pelvis will shift to accommodate your baby during birth. The bones in your baby’s head are separated, not fused like an adult’s, so they can move during birth. With chin tucked in and the help of labor contractions, baby will work their way through your pelvis. Your movements and position changes during labor will help. With upright positions, gravity will help your baby move down the birth canal. You may be getting pressure to induce your labor before baby gets “too big.” Many women are induced because their care provider suspects their baby is large. However, plenty of research makes it clear that inducing labor when the baby is thought to be big increases the chance of a cesarean delivery without any benefits for the baby or mother. In fact, many babies who are supposedly “too big” turn out to weigh a lot less than expected. This is because both ultrasound and clinical estimates of size are unreliable. Most estimates, even by seasoned doctors and ultrasound technicians, overestimate baby’s size. For these reasons, the American College of Obstetricians and Gynecologists (ACOG) says that suspecting that a baby is large is not a medical reason for induction. Let labor begin on its own; walk, move around and change positions throughout labor; bring a loved one, friend or doula for continuous support; avoid interventions that are not medically necessary; avoid giving birth on back and follow the body’s urges to push; and keep mother and baby together — it’s best for mother, baby and breastfeeding. The way you labor is much more likely to influence your birth journey than your baby’s size. Repeat these affirmations to yourself: “I am growing the right size baby for me. My body is made to birth my baby. I will be able to birth my baby.” Birth your baby with the confidence that you can do it, because you can.